These door and window contacts are perfect security add-ons for the Honeywell RCWL300, RCWL330, and all décor series chimes. Be alerted when a basement door, a poolside gate, or a window is opened for added security and peace of mind around your home or small business. 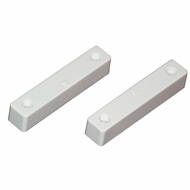 This product also requires the purchase for the RPWL3045 converter for use with Honeywell door chimes.